Peerless FPZ-600 Flat Panel TV Stands provide a safe and secure solution for displaying digital content in public areas like conference rooms, lobbies or convention centers. The versatility and functionality of this solidly engineered stand enables a single TV, two TVs back-to-back, two TVs in portrait orientation or even four TVs in either landscape or portrait orientations (may require additional accessory). Integrated security fasteners lock the TVs in place, virtually eliminating theft, while internal cable management completely hides all wires and cables enabling a clean, professional look. 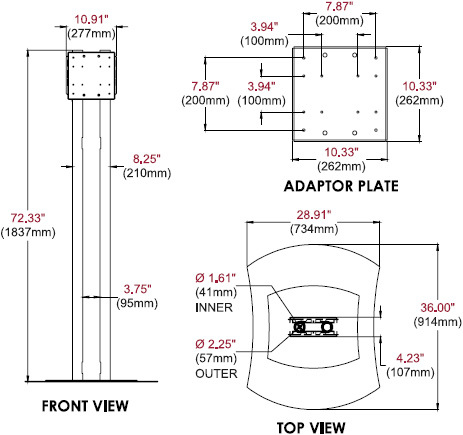 Helpful Hints: When mounting in portrait mode do not use PLP-UNL or PLP-UNM adapter plates. A dedicated PLP must be used in this application. Monitor Size Up to 70"